For the rest of the week while I am in the middle of a chaotic house and dreaming of what will be, I've decided to share a photo per day of scenes from around our 70 acres. Trees do whatever they can to survive the deluge of snow on Avalanche Slope. 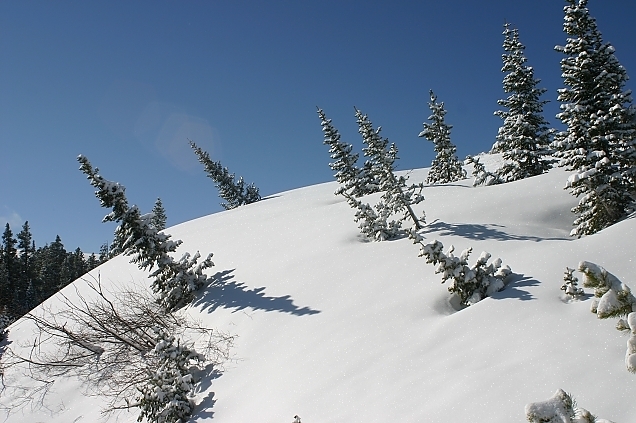 Depending on the snowfall, many trees end up buried under the heavy snow, hence the lean. It’s amazing they can survive that. They can’t photosynthesize while buried, I imagine! Do they stay buried long? Steve, it depends on the winter. Most of the time they are buried for several months. Their growth is definitely stunted. We have a little group of aspens on that slope that are completely covered. They don’t grow much and will never be tall trees. Previous entry: Are We Crazy? Enter your comment into the form and press "Submit" to save it. Feel free to use Smileys. Comments are moderated and won't show up immediately.